Today in the Belgrade City Assembly, there was the official media conference a day before the athletics spectacle in the Kombank Arena – European Indoor Championships (3-5 March 2017). The European Championships is going to last 3 days; the start is tomorrow morning at 9:30 a.m. while the opening ceremony is scheduled for 4 p.m. Belgrade hotels are full of sportspeople and tourists from the whole Europe. During these three days, 800 competitors will participate in 24 disciplines. Out of 12 Serbian athletes, eight are performing the very first day. 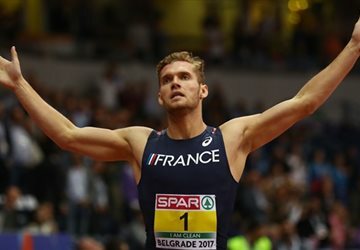 - Heptathlon bronze medalist from the European Indoor Championships 2013, Serbia’s Mihail Dudaš. The Mayor of Belgrade Siniša Mali thanked the European Athletics Federation for the confidence and trust – The City of Belgrade is going to be a host to the best athletes of Europe and thousands of tourists visiting the city. The small hall of the Kombank Arena is for the first time functional, and after the event it will be used by young sportspeople. We are proud to have made the Arena so representative. All those who come here will be satisfied with the atmosphere. I am using this opportunity once again to call citizens to come and support our athletes. President of the Athletics Federation of Serbia Veselin Jevrosimović thanked the Government of the Republic of Serbia, Ministry of Youth and Sports, the city of Belgrade and all sponsors headed by the general sponsor Telekom Serbia who all supported and helped the organisation of such a big event. – When I said to Mr. Hansen and the people from EAF, 2 years ago in Prague, that this was going to be one of the best championships ever, they were a little bit suspicious. Now all the suspicions are gone. We did a great job. The European Athletics Indoor Championships is the biggest competition in individual sports ever held in the country. There are 800 athletes, 2500 people accompanying them, 650 accredited media representatives, 450 volunteers, and 300 security guards. This was a major project regarding complexity and some technologies will be applied here for the first time – said Jevrosimović. LOC President Slobodan Branković pointed out that all the hotels in Belgrade are full – Today is the rehearsal of the competition and I hope that tomorrow at 9:30 a.m., when the first race starts, everything will follow the plan we have been preparing for the last two years. I am sure that everybody will leave our city with the best possible memories. CEO of the EAF, Christian Milz, said that, if anyone has any doubts about the venue, it is enough for them to come to the Arena to see that everything has been already prepared. He also announced a special anti-doping programme aiming at the clean athletics in the future. The Serbian athletes pointed out that the full Kombank Arena will not make them stressed. 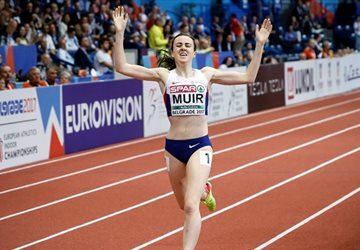 “I’ve been preparing to attack the throne and defend the European indoor champion title from the last year. There’s no room for pressure; I am prepared for a jump over 7 meters and I’m sure I’ll do my best,” said Ivana Španović. “We will be surrounded by home audience, they will cheer for us and there can be no bigger motivation than to prove ourselves in front of the people who mean a lot to us. The competition is extremely strong. I know they’re in good form, but I’m too,” said Dudaš. “I created my own pressure for myself. This is my third EIC and, hopefully, my third medal. A shot over 21 m is going to bring a medal and I’m ready to throw that far. It’ll be tough, but I count on the support from the stands.” said Kolašinac.